The children use papier mâché to make traditional Kachina dolls, a Native American Indian art of the Hopi tribe. For ages 9 to 13. Plan 4 to 5 sessions. Click here and scroll down to see six pictures of traditional Kachina dolls. 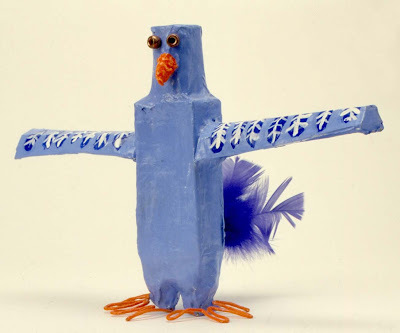 Note: Papier mâché pulp is good for forming small parts on the Kachina dolls, such as arms, feet, and beaks. To prepare the pulp, rip newspaper into roughly one-inch pieces, cover with water, bring to a boil, and simmer for an hour. Turn off the heat and let sit overnight. Put wet newspaper and water into a blender in small batches to make a mash. Squeeze out as much excess water as possible. Mix some wheat paste to a very thick consistency. With your hands, blend enough of the wheat paste into the newspaper mash to produce pulp the consistency of stiff mashed potatoes. Two full sheets of newspaper should make enough pulp for small additions to about four figures, depending on their size. The pulp can be stored in a refrigerator for several days. Kachinas of the Hopi Native American Indian tribe represent the spirits of the Hopi ancestors and their beliefs, and aspects of nature such as the earth, wind, clouds, sun, rain, animals, good health, and a rich harvest. Dolls are carved to embody the characteristics of the Kachinas and given to the children as gifts. Hung on the walls of the pueblo, the dolls are used to educate the children about the different types of Kachinas. Traditional Kachina dolls date back to the mid-nineteenth century and were carved from a single piece of cottonwood. The early dolls are simple in form, mostly cylindrical with very few protruding parts, and painted with natural pigments. Round, rectangular, or half-moon eyes were painted on the faces, or pop-eyes were carved from wood and attached. The noses are rarely realistic-looking and the mouths were either painted in the shape of a rectangle, triangle, or crescent, or carved as a beak or short snout and then attached. On the doll’s head can be found bird wings, ears (which are typically large), hair, feathers, or horns. Through the years, Kachina dolls have become more realistic. Dressed in actual clothing (rather than painted) and given action poses, the dolls are now displayed on stands for tourists and collectors who no longer hang them on walls. Cover the work area with newspaper. Set out scissors, glue, and masking tape. Have available pictures or examples of Kachina dolls. 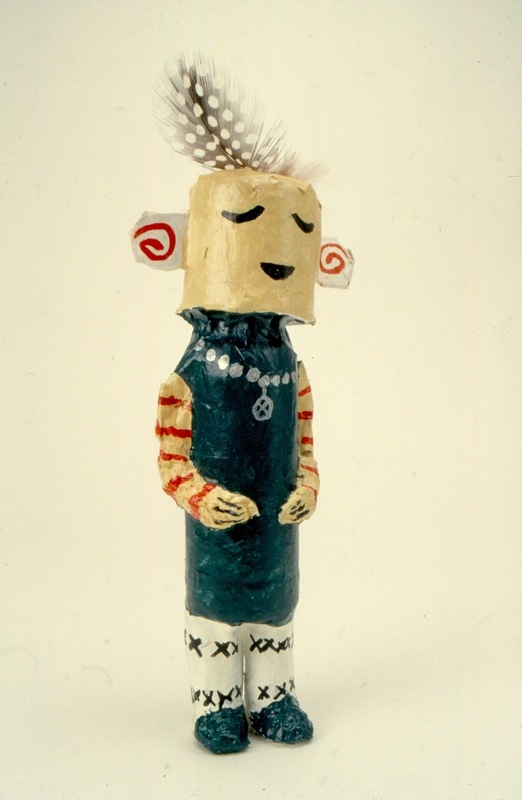 Share examples of the Kachina dolls, telling the children about their history, purpose, and unique characteristics. Explain that they will be making Kachinas with papier mâché, a process using paper dipped into paste. When the paste-soaked paper dries, it becomes very hard and can then be painted. 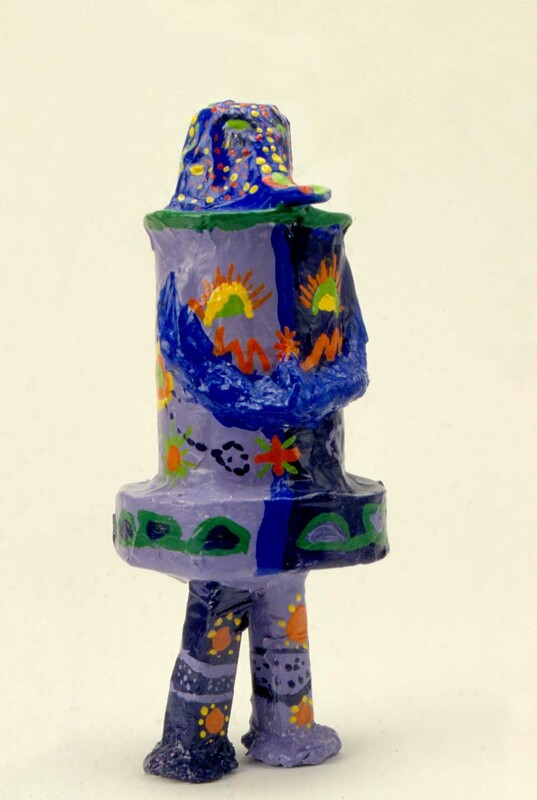 In this session, the children will be making the foundations for their Kachina dolls and in the next session they will be applying the papier mâché. Demonstrate how to make the foundations for the Kachina dolls by gluing together a variety of boxes and miscellaneous items. Cardboard boxes and tubes can be used as they are or cut to create new shapes. Attach pieces together by applying glue to both surfaces that are to be joined and holding them in place for a few seconds. If necessary, use small pieces of tape to keep the shapes together until the glue dries. Like the traditional Kachina dolls, the children should keep their dolls under ten inches tall. Mix the paste to a creamy consistency and put into bowls, planning one for every two children. Tear newspaper into approximately 1- byx 3-inch strips. Set out paste, torn newspaper strips, and optional pulp. Prepare a non-stick surface, such as waxed paper, for drying the dolls. Explain to the children that, in this session, they will be applying at least two layers of papier mâché to their Kachina dolls. Demonstrate the papier mâché process by dipping strips of torn newspaper into the prepared paste. Pull the wet strips between two fingers to remove the excess paste to keep the foundations from becoming too wet. Lay dampened strips on the dolls, overlapping (laying each piece slightly over the previous one) and smoothing the edges as the entire surface is covered with one layer. Carefully wrap the papier mâché around the forms to maintain their shapes. As the children start to apply their papier mâché, warn them that the first layer is the hardest. The second layer is easier because the paste-soaked paper will stick to itself. If using pulp, apply it before the last layer of papier mâché. Although it contains paste, the pulp will adhere better and be easier to paint if it is secured by a final layer of papier mâché. When the dolls are completely covered with at least two layers of papier mâché and carefully smoothed, have the children put their names on small pieces of paper with permanent ink markers and paste them directly on their wet forms. Set out tempera paints, brushes, water containers, and sponges. Set out the dried dolls. In this session the children will be painting the first layer of color on their Kachina dolls. In the next session they will be adding details and designs. Show the children how to paint any rough edges of the dried paper mâché by filling the brush with paint and dabbing into the crevices. Carefully brush over the area to remove any puddles of paint. Have the children apply the first layer of paint on their dolls. If time permits, have them apply a second layer for better coverage. 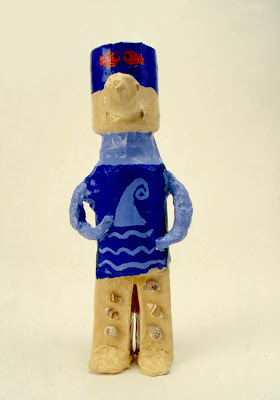 In this session the children will be painting details and designs on their Kachina dolls. Review the characteristics of traditional Kachina dolls and discuss the symbols which suggest what type of Kachina they represent. Have the children add details and symbols to their dolls. They can use Native American Indian symbols or create their own. Note: Have an adult apply a coat of water-based polyurethane to the dried dolls to protect and strengthen their surface. Set out scissors, glue, dried dolls, and odds and ends. Some children will not need to add adornments to their dolls. Prepare an activity for them, such as sketching their completed dolls and adding color with markers or colored pencils. In this session, the children will decide if their Kachina dolls will benefit from additional adornments such as feathers, beads, or seashells. Additions should be made with the purpose of better describing what the Kachina dolls represent. Have the children attach the adornments to their dolls with liquid glue. Keep the dolls less than ten inches tall to allow more time for adding details. Small plastic liquid soap containers and small boxes like the ones from cosmetics or medicines have interesting shapes and will keep the dolls from becoming too large. Extra-strength glue sticks with their fast bond will hold the parts together until the papier mâché is applied. However, liquid craft glue creates a more permanent attachment for the adornments. Newspapers that use soya-based inks are less messy and easier to work with. Tear the strips vertically, leaving the rough edges which are easier to smooth. Although not as easy to work with, thinned white liquid glue can be substituted for the wheat paste. LET’S TALK ABOUT OUR WORK. Are the Kachina dolls sturdy? Have the children share what their Kachina dolls represent. Discuss the symbols and adornments on the dolls used to describe what they represent. I'm having trouble making a plastic lid stick to a plastic bottle. My doll keeps falling over. Feathers all over my bird won't look good. I think I'll just paint on a design that looks like feathers. If the glue isn't holding your parts together, add pieces of tape until the glue dries. Putting feet on your doll will help to balance it. You can use boxes, wire, or in the next session you can use papier mâché pulp. Painting the feathers on your doll is a good idea. It will allow us to see the wonderful shape of your bird Kachina.